So after coming across Nick Cambell’s ‘Bourne’ tutorial using Cinema 4D and Transform, I thought why it couldn’t just be done in After Effects with flat 2D bits in 3D space. Those 2D pieces floating around in a 3D space just screams After Effects to me since there are no extrusions of any sort. Here’s a semi-solution I came up with in After Effects. If you haven’t watched the original trailer yet, you can watch The Bourne Legacy Trailer here. 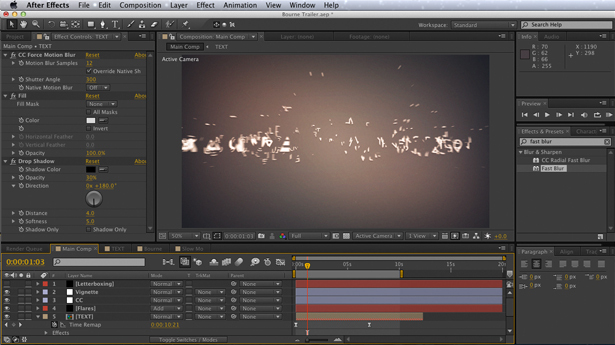 Of course there are some limitations doing this with the CC Pixel Polly effect within After Effects. It doesn’t give us quite the full control like slicing and animating the bits manually, but it does give us enough control to pull off the general look. Play around with it, add your own twist, and tweak the keyframes and you should be able to pull off something that looks pretty sweet. To really emphasize the effect, I’d recommend duplicating the shattering text layers a few times and offsetting the last keyframe to create more bits and pieces. My changing each shattering text layers with different rotations and sizes, you’ll create more dynamic and random pieces. By offsetting or dragging out the animation of certain text layers, you’ll create more variation in the formation of the final text. Basically, duplicate and change a lot of text layers and you’ll get something dynamic and awesome. I only made two text layers (fill text layer and stroke text layer) to demonstrate the process for the tutorial. If you guys have any feedback or opinions, feel free to leave them down below. Thanks so much for your kind comment, your support encourages me to continue!